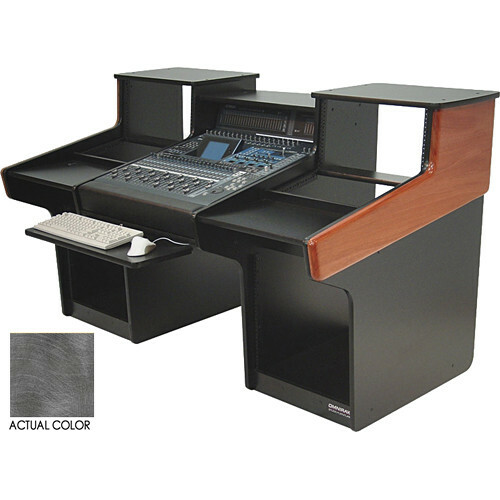 The MixStation Workstation for Yamaha O2R96 (Pewter Brush) from Omnirax is an ergonomic workstation designed for the Yamaha O2R96 mixer and its associated peripherals. The MixStation features two rack cabinets to hold standard rackmount gear. A recessed center section houses the Yamaha O2R96 mixer at a comfortable height for mixing, while offering ample legroom. A padded wrist rest along the front edge matches the dimensions of the mixer. Cabinets have ten rack spaces below, with a work surface in front of five sloping spaces at console height. There are six additional vertical spaces topped by a solid monitor shelf. The cabinets are open in the rear for wiring access. Box Dimensions (LxWxH) 52.0 x 41.0 x 23.0"